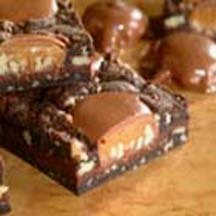 An irresistible chocolaty confection loaded with crunchy pecans and chewy caramel in every bite. Preheat oven to 375°F (190°C). Grease 13x9x2-inch baking pan. Microwave morsels and remaining evaporated milk in small, microwave-safe bowl on HIGH (100%) power for 1 minute; stir. Microwave at additional 10 to 20-second intervals, stirring until smooth. Gently spread over cake layer. Place Turtles on cake layer; drop remaining cake mix mixture by heaping teaspoons between Turtles.